There are 12 tires attached to four vehicles in the following video. All twelve tires are up to the task of delivering a serious amount of enjoyable action. 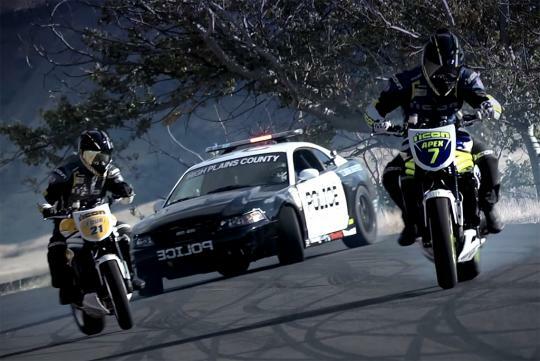 The video is from Icon Motorsports, and it pits two motorcycle riders against a cop whose patrol car is a bit unorthodox. There's also a remote control truck that gets in on some of the action. The car is a 2004 Ford Mustang Cobra that comes complete with serious drifting angles and a delicious supercharger whine. Like the car though, the bikes see fit to get just as sideways. Almost as wonderful as the driving action, however, is the road that it all unfolds upon. Apparently Oregon is hiding a motoring slice of heaven that needs to be explored in more detail. It's a twisty stretch of tarmac that has us drooling, and it's a perfect way to kick off a work week. It's also a hell of a way to advertise your products... well done, Icon.